CNBC: Welcome – nice to see you in person. Let me just ask you, you said in response to a journalist’s question that these are ‘sad elections’, but it is important that there is political stability of sorts for Greece going forward. Given that that’s the case, you’d be keen to see Syriza back in the driving seat, I imagine, after the elections are held? I would most certainly want to see stability as you say, because Greeks have suffered enormously for quite a few decades to establish a democratic process that functions, and we have managed to do that, we have a well-functioning political democratic system and it’s important to preserve it. Having said that, what is of the utmost necessity, and has been for a few years now, is to have an economic policy – a reform agenda – which ends this extend and pretend nightmare of the last few years. We constantly accumulate new debt, piling it up on already non-viable debt, pretending that we’ve solved the crisis, the debt deflationary spiral is enhanced, and the country becomes unreformable. It is something that the political system has not managed to address. Which party can do that now? The reason why I call this the ‘sad election’ is because I don’t think this parliament is going to be able to do it. CNBC: So let’s be very clear, you’re not in the business of giving an endorsement to Mr Tsipras or to the Syriza party at this point, even though you are effectively of the Syriza party? Well the reason why I’m not standing is because I cannot look my electorsin the eye, the people who voted for me last January, and say to them that our party, Syriza, is capable now, given the agreement that we have signed with the lenders, to implement a reform and fiscal agenda that may stabilise the economy. I believe that Alexis Tsipras, for whom I have a great deal of affection, and to whom I send my best wishes, believes it either. In the parliamentary sessions where he was pushing for the endorsement of these agreements with the Troika, he himself said that this is, he called it, a ‘very difficult programme’, but in other interviews he has come clean on that, he considers it to be non-viable, as does the International Monetary Fund. 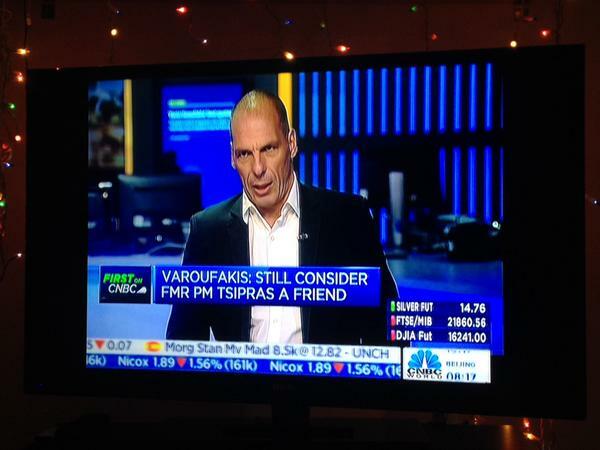 CNBC: Do you still consider Mr Tsipras a friend? CNBC: So there’s no truth in the schism growing between the pair of you as he moves the party now to centre ground? There’s been a political disagreement, but one hopes that friendships can survive political disagreements. If we are not capable of maintaining human relations while at the same time agreeing to disagree, then we would have failed at a very basic human level. CNBC: The market and a lot of watchers have been wondering what type of man Alexis Tsipras is following the referendum and his success politically, with some saying he’s a masterful politician, others think perhaps he’s just a newcomer who has had a little bit of luck and is now on borrowed time, or perhaps he’s a man that has really great mentors in Brussels. How would you describe him and his political success so far? Oh there is no doubt he is an excellent politician. I’ve watched him up close; he has what it takes to be a genuine leader. There were very important junctures when he demonstrated his leadership and I witnessed it. But, the political situation in Greece is so toxic, and has been for years now. When you have an economic system which is in free fall and you have this astonishing situation, I don’t think that economic history and political history has ever seen this before, you have lenders, creditors, who are imposing upon you new loans under the conditions that will ensure that they will not get their money back, I think this is a unique historical phenomenon. So no politician, however skilled they might be, can survive the economic implosion which drags down along with it the political system. CNBC: But Syriza hasn’t helped out here, and we’ve got the spilt from the left platform who have created their own party. Has this been detrimental to Tsipras’ future or has it handed him a golden opportunity to move to the centre of politics? No, look, this kind of thinking would probably be appropriate under normal circumstances, but thisGreeceis not experiencing normal circumstances. What happened on the 12th of July was that there was an imposition by the Euro Summit of a programme that everybody in the Euro Summit knew was unviable on an economy which is in a great depression and this debt spiral, debt deflationary spiral, so once you come to this state of irrationality, reflecting Europe’s dithering, Europe’s inability to make up its own mind as to what it wants to do with its monetary union, there is no sense in going into this discussion about left, right, moving, shifting to the centre, median voters and all that. Think of what happened to the previous governments. The socialist government of the Papandreou period of 2010 and 2011 imploded, the conservative government of Samaras imploded, our government imploded. Why? Because we rest on a foundation of an economy which is imploding and until and unless the economy gets stabilised, and we have some sensible discussion about debt, about investment, about credit, about reforms, which we have not had with the Troika because they were not interested in it, while they are sorting out their own disagreements about what to do with the monetary union, Greece is going to be the canary in the mine. CNBC: But, having said all of that, there is within the latest agreement, room for discussion later on about debt sustainability, and that clearly within the agreement there was some explicit acknowledgement of the need for debt relief, that appeared to be acknowledged, but do you think what’s critical to that is that Christine Lagarde and the IMF are full participants in the programme ultimately for that to happen? CNBC: So you’ve kind of got what you wanted? Not really though, because an unpayable debt is not going to be paid, a debt that needs to be restructured will be restructured. Like the laws of gravity, there is an inevitability about this. As every participant in financial markets knows, there are two ways of dealing with an unsustainable debt. One is a therapeutic way: you begin with debt restructure and then, once you have decided on how to restructure your debt, you set your primary surplus targets. So the reason why you have debt relief is so as to have lower primary numbers or targets in order to attract investment, to signal to the markets that you’re not going to hit them if they invest with high taxation later on, trying to sustain an unsustainable primary surplus. What we have been doing, what the Troika has been doing, is setting incredible, paranoidly high primary numbers which everyone knows are unsustainable and then saying let’s see what tax regime would produce these primary surpluses. By that time you’ve lost the game, and then you say oh when the time comes to decide that we can’t repay the debt, we will restructure it. In other words, we put the cart before the horses. First we should have had the debt restructure, to decide what the right fiscal policy should be to attract investment, do something about the banking system which is replete in non-performing loans, and then once you do that you can begin to reform the economy and society. Except we have done it exactly the opposite. CNBC: Let’s come back here, you’re on the record very clearly about the election and about how you dislike the terms of the negotiated agreement, but do you think that just may be a fault line in your personality, if I can use that language, because you’re an economist but not a politician, and what we have is a politicians agreement that’s been conjured up here and yes, you look at that 2016 target, 0.5% primary balance target, it looks unsustainable but it’s a back loaded target and so in many ways what has been done here is some room has been created, flexibility has been embraced, look at the MOU specificity, 30 pages against 50 pages for the second bailout programme, there are some big gaping holes in this agreement that has been negotiated by politicians not economists, do you think that could be your misinterpretation of what’s going on here, you want an economists outcome, this is a politicians outcome. I want a viable agreement. Greece has been in the headlines, and you have been talking about us for 5 or 6 years now, because of extending and pretending. We’ve been having these kinds of MOUs that were not worth the paper they were written on. It doesn’t even need an economist to take a look at them, a 10 year old with some basic arithmetic skills would know that if you have an unsustainable debt, which we had in 2010, and you try to solve it by pretending it’s a problem of illiquidity, and piling up on it the largest loan in history on conditions of stringent austerity that would shrink the incomes from which the old and new loans will be repaid, a 10 year old knows that that cannot end well. It didn’t end well in 2011, 2012 but they’re continuing to do this. Am I an economist? Guilty as charged. Am I a politician? I believe I am, my electors thought so and they elected me. As a citizen of Europe, I’m asking from my colleagues, all of the other politicians and economists, for a very simple common project: To end the extending and pretending. CNBC: And already the 2015 privatisation sales target looks like it’s going to be missed, do you think that if it is missed that once again we’ll end up with the same kind of table tennis that effectively international lenders come back and say well look, once again Greece has failed to uphold its part of the bargain here. I very much feel like this was part of the plan of some of the smartest people around the table. CNBC: So you think it’s a conspiracy theory? There’s no conspiracy, it’s a straightforward, well stated plan. The German finance minister has made no bones about that, he believes that Greece is not sustainable, that this third MOU will fail, and he very reluctantly agreed to it under a lot of pressure from the rest of the Euro Group, the rest of the Eurozone, but he has told me that the thinks the only solution for Greece it to exit, to take time out, and so if we reach in two or three months’ time in the first or second review the conclusion that you mentioned, that’s water to his mill, and water to the mill of those who see the fragmentation of the Eurozone as the only solution. Let me stress that I’m not one of them! CNBC: So it doesn’t surprise you if the privatisation programme doesn’t meet the target? Look, in a market where asset prices have gone through the floor, is it any wonder that ridiculously high revenue targets have been missed? What we were recommending when I was in the ministry was this: We have these public assets and we have to use them efficiently in order to generate home grown investment, their price now is next to zero. So the thing to do is to create an investment vehicle, to put them in there, to separate them from government, to have an efficiently run investment vehicle which eventually will be granted a banking licence, collateralise these public assets, create an investment flow into these public assets to develop them and, once the economy is picking up and prices are catching up with the underlying values, then consider selling them in a way that combines the interests of the long term with the medium term. That kind of discussion never got us anywhere, because the creditors wanted a quick fire sale. a quick and dirty agreement. CNBC: You keep talking about the situation from the point of view of what is good for Greece, but you spoke a moment ago as a citizen of Europe, you must also then consider what is good for the rest of Europe, and you have been quoted in the past talking about some your fiercest enemies, some of them coming from countries that you thought would be supporters, the likes of Portugal, Spain, Italy and Ireland, these are countries that signed up for assistance and have gone through fairly fierce austerity programmes as well, if there is a haircut for Greece, surely you must accept that this would be very negative for those countries who have signed up for austerity programmes? Let me be very frank on this, what is happening now is going to guarantee that they will not get their money back, this free fall means that the cow which has to produce the milk is going to die. So in our negotiations, when I was leading them, I would look at my colleagues from Ireland, from Portugal and Spain and say: The whole point of our negotiations is to agree on a programme which is viable so as to maximise the net present value of our repayments to you, and refusing to discuss a sensible debt restructure based on financial engineering, on swaps, refusing to do that minimises the value that you’re going to get back from us. CNBC: During his 7 months in office, the former Finance Minister tried to steer the Greek economy through one of the rockiest periods since the crisis began. A key member of leftist group Syriza, he – along with Prime Minster Alexis Tsipras – led negotiations with Europe on the most recent bailout, which prompted a referendum loss that splintered the party and paved the way for another snap election. Just to come back to some of the questions around currencies, Alan wrote in and asked, did you really have the Drachma on hand ready to pass out and how low would you have priced the rate hypothetically if the currency had been put out in the community to replace the Euro? The second part of the question is irrelevant, because the answer to the first part of the question is: “Absolutely not!” We were not in the business of planning for Grexit, of the Drachma, that was not our mandate and that was not my considered opinion on what needed to be done. What we were trying to do were two things. Firstly, to plan for difficult periods of remaining in default within the Eurozone while the negotiations became serious, because they were not serious for many months. The reason why they were never serious – seriously conducted – was because the other side was not serious. They were not interested in having a viable agreement with us. They just wanted to run us into the ground by squeezing our liquidity until we bowed to the inevitability of a failed programme. So, in other words, we were trying to create circumstances for a parallel payments system in Euro dominated IOU’s – electronically issued, and transacted. So as to stay in the Euro. Not to get out of the Euro. Of course, we had a plan B for the Drachma – in exactly in the same way the Minister of Defence has various contingency plans in case the country gets invaded. That’s not to say you want to get invaded. Or you’re planning for the invasion; this is just a contingency plan. So this was the issue, once they closed down our banks, which they did, after the 27th June Euro Group meeting: Could we survive long enough within the Euro while the negotiations heated up? CNBC: Do you have personal any animosity towards Mairo Draghi – because ultimately – I think – it was that 28th June announcement, where he said ‘we’re going to have to withhold further liquidity for the Greek banks, unless we get some progress on negotiation’ – that, it seemed to me, galvanised the next stage of events, if you like, and perhaps you could argue ultimately led to you having to be removed from the negotiating process. The answer is none at all – I consider Mairo Draghi to be an exquisite central banker – who is trying to do the best of a very difficult job. The central bank of Europe is a paradox: on the one hand it’s supremely powerful. On the other hand, it’s utterly powerless. It reflects the incongruities within the Eurozone. In a sense, we created a monetary union featuring a central bank without a state to have its back, and states without central banks. This is the environment in which Mairo Draghi labours – I mean, look at quantitative easing, he has to try to defeat inflation, but is constrained to be buying mostly German bonds. In other words, not to address deflation where it occurs – in countries like Spain, Greece, in particular. The country that needs QE the most, Greece, is not part of QE! And that’s not because Mairo Draghi doesn’t want it. He is so badly constrained; he’s in an iron cage of constraints and rules he has to work with. So it was not his decision – I’m sure he didn’t want to shut down our banks. It was the Euro Group’s decision that denied us an extension of a few weeks to have the referendum in peace and quiet that forced Mairo Draghi – in the context of his own charter – to pull the plug from our banks. CNBC: Let me ask you about another relationship, it’s a question a lot of our viewers have been asking. It’s about the relationship with Wolfgang Schäuble – and in particular – why there was no compromise. We’ve been raking over a lot of the comments you’ve made with Schäuble – and particular, his time out. And how was perceived by you in particular. The direct question though is from our viewer – whether the ego for both of you was too big. Was this why there was no compromise? No, not in the slightest. the reason why there was no compromise was because the Eurozone is so badly designed. And Wolfgang Schäuble understands that. We agreed on a number of issues concerning the problems with the architecture of the Eurozone. We disagreed on how they should be fixed. But, of course, this is not something for the Greek Finance Minister to agree with Wolfgang Schäuble. Greece is too small and too insignificant. The discussions were very interesting, but this is something to be resolved between Berlin, Frankfurt and Paris. And they have not resolved it. The major incongruity is this: you have Germany and Wolfgang Schäuble insisting on a programme for Greece as a condition for Greece to remain the Eurozone. The Greeks want to be in the Eurozone, but they don’t want this programme. Schäuble understands that if this programme is implemented Greece will fail. But, at the very same time, it’s important to him – at least that’s what he thinks – that Greece remains under the iron fist of that programme in his dealings with Paris. So we have a chess board, and Greece is just a little pawn, to be sacrificed in a game that is not getting Europe far along the path towards consolidation. CNBC: We want to take you back to the beginning of the year, before the previous government fell and obviously as a result of the lack of ability to elect a new president – the country had reached a surplus, it was anticipating some small level of growth this year. And then, of course, the elections happened and then things changed. I wonder whether in some way this Syriza government – as a result, of the deterioration we’ve seen – and not following through on some of those promises – you let the Greek people down in some way. And looking at the polls now for the next election – do you understand some of the confusion the Greek people face with just who to trust going forward – of any of the politicians in Greece? Let me answer in two steps: Firstly, there was no growth towards the end of 2014. This was a statistical mirage. All that happened was nominal GDP continued to fall, but average prices were falling faster – a sure sign of a deepening depression. And let me put it differently, during my tenure as finance minister the latest statistics show from EuroStat that real GDP (i.e. actual GDP divided by average prices) grew even faster than it was doing towards the end of 2014. So if I were a ‘good’ politician I would say, “Look! I’ve succeeded!” But, I’m not a ‘good’ politician. So I’m going to tell youthe truth: All that happened was that this great depression continued. There was never any chance of growth under the previous MOU. And there’s no chance of growth under the current MOU. Did we frustrate the Greeks and did we let them down? If you watched the negotiations and the impact they had on the Greek polity – during the 5/6 months I was in government – I think we gave Greeks their dignity back. Because we did something quite unique in the Eurozone. We stood up and we said, as an indebted nation, that we won’t take on more loans until we stabilize the Greek economy. I said that as the finance minister of a bankrupt country I’m not going to sign on the dotted line of another agreement that is not viable, taking money from our European partners – which I know we can’t return. And Greeks felt particular proud of that. Did we let them down? I think we did. We energized them to vote ‘No’ courageously in that referendum. 62% was just an astonishing result. And then, on that same night, we turned that ‘No’, into a ‘Yes’. We effectively bowed again to another extended & pretend. That was the night I resigned. CNBC: The migrant crisis has cast a light on the lack of unity and divisive agendas operating within the European Union. Next week, Jean-Claude Juncker, President of the European Commission, will propose a major increase in the number of migrants each EU country will be expected to temporarily take in. So far this year, 160 thousand people have arrived in Greece alone. Yanis, what’s gone wrong with the way Europe is managing the migrant crisis? Well in the same summer Europe managed to jeopardize its integrity twice. Once by threatening Greece being threatened with expulsion from the Eurozone in order to impose upon it an austerity package that won’t work. Then, Europe managed to lose its soul, by treating aboninably extremely needy people, coming to our shores under hideous conditions, seeking refuge. We, Europeans, instead of taking them in, began to bicker on who – and it what way – would share the burden of looking after them. It was a disgraceful display. I think, as I said, Europe’s soul has been very sorely tested by this. When you have women, children, young people, old people arrive in their thousands on your shores. During a very specific point of time, this is clearly not an attempt by them to jump the queue of migration or anything like that. This is a humanitarian crisis. What you have to do at that point is just throw your doors and gates open and the share the burden of doing this within Europe. Instead, the sight of our leaders squabbling as to who is not going to do their humanitarian duty towards these people – this is going to remain as a stigma upon Europe. CNBC: I can’t help draw parallels as to what’s happening now with the transfer across Europe; with the breakdown of Schengen, the crisis management of the EU, the Eurozone and broader Europe as well. And compare that to other crisis. Be that the Greek debt crisis; whether it be broader crisis across Southern Europe as well. And when is comes to the crisis situation, the architecture still isn’t in place after six, seven years of crisis to deal with this as well. And actually, the Euro, the Eurozone at the moment, the movement of people. We’re still very much a half-way house where when push comes to shove, we still go back to our sovereign rules rather than some form of commonality. You’re quite right; in the end we created a common currency which divided us. And the deeper those divisions grew, the greater the failure to be united when it came to other matters. For instance, the refugee crisis. For instance, ways of dealing with the dearth of investment throughout Europe. Instead of getting closer together we were torn apart. In the United States, in the 19th Century, there was one financial crisis after another. Even at the beginning of the 20th century – and especially after 1929. Every time, the United States faced a major financial crisis it managed to consolidate. To get closer together. To create institutions that were common and which created shock absorbers for the system. In Europe, the idea was that we must bind ourselves together by means of the same currency in order to create this process. But, the first time a crisis tested us, following the financial that began in Wall Street, the City of London, and so on – we failed. Instead of consolidating, we are dividing and multiplying. And failing at other realms. So Europe’s monetary failure is spreading to other realms.